Launched in Spring 2018, Atlas Chiropractic is led by founder and lead chiropractor, Ben Dyer. 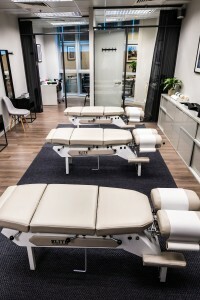 Stepping away from the traditional chiropractic clinic, Atlas philosophy is based on developing a community of clients who are empowered with the tools they need to achieve optimal health and quality of life. The Atlas philosophy is reflected across our studio and activities. Clients of Atlas are given access to leading diagnostic testing, workshops led by those in health and wellness industry and yoga classes to help our clients achieve their personal goals and full potential. Atlas is now seeking a professional, energetic, dependable Chiropractic Assistant to join our team, during a period of exciting and ambitious growth. We are looking for a dynamic individual, who has the agility to turn their hand to a variety of tasks. You’ll be responsible for welcoming and building a rapport with clients as you support our chiropractors meet their client’s needs. On a daily basis your primary responsibility will be to oversee client schedules, support chiropractors needs throughout the day and perform studio duties. You’ll be meeting and greeting clients, scheduling appointments, organising X-rays for cliens and maintaining accurate client records and ensuring efficient client flow. Full training will be provided and there is no pre-requisite for experience in a chiropractic clinic.